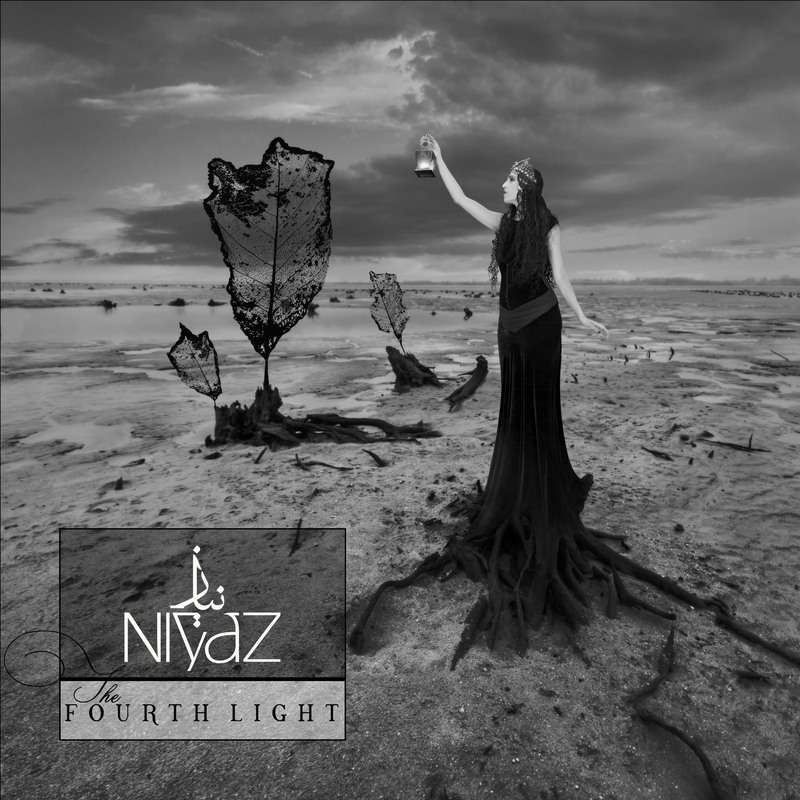 The Canadian/Persian band Niyaz have been around since 2004 and have five previous releases before this new album, The Fourth Light. One of the most welcome aspects of the post-music-industry economy is that incredibly talented artists such as Niyaz have the possibility of releasing fan-funded albums without the interference of record labels. In this case, a modest donation gets you a digital download of the album and there are various options beyond that which can include a CD, a signed CD, a t shirt, a handwritten lyric sheet. A 20 minute Skype call with Azam Ali and Loga Ramin Torkian, a private music lesson with Loga Ramin Torkian, a limited edition lithograph of the cover art…and more! What a creative way to raise funds for a project! Niyaz has until recently comprised of DJ, programmer/producer and remixer Carmen Rizzo, vocalist and hammered dulcimer player Azam Ali, formerly of the group Vas, and Ali‘s husband, Loga Ramin Torkian, of the Iranian crossover group Axiom Of Choice. Carmen Rizzo left the band amicably in 2013. Niyaz are superb musicians but manage to not disappear up their own arses as too many virtuosic bands do. Their instrumental, vocal and production skills are second to none; this music is not self-indulgent, it is flawless but very accessible. 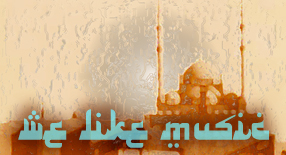 Although rooted in the traditions of Persia and with influences from Turkey and other parts of the Middle East, this is not difficult music for anyone hearing it for the first time. The nine tracks all feature beautiful Iranian percussion – there is some lovely frame drum playing on Tam e Eshq, Eyvallah Shahim and Marg e Man in particular. The drums and percussion are mixed high in all the tracks which I like. When playing is that tasteful I want to hear it! There is some evocative flute on some tracks (I presume a ney) and various stringed instruments are perfectly set in the mixes, audible yet without detracting from Azam Ali’s (as always) exquisite vocals. She sings in Dari, Farsi, Urdu and Turkish. Melodies sometimes dip into those gorgeous Persian modes that instantly transport the listener to a distant land – check out the flute in Eyvallah Shahim. Niyaz are not a traditional folk band, however, and there is understated electronica underpinning most of this album. It merges seamlessly with the acoustic instruments. “The Fourth Light” is a tribute to the first female Sufi mystic and poet Rabia Al Basri (Rabia Al Adawiyya) who was born in the 8th century in Iraq. The album features original songs we have composed inspired by her great spirit and universal message of love. In today’s modern world where women are still striving in every aspect of life, to rise above the status of inferiority placed on them by patriarchal societies and laws, Rabia represents a true feminine icon that embodies every aspect of feminine and spiritual liberation. The Fourth Light will also feature several old folk songs from Iran, Afghanistan and Turkey with new and modern arrangements. One of the cornerstones of our music has always been the underlying social message aimed at raising awareness about the plight of ethnic and religious minority groups in the Middle East. It’s an album I recommend without hesitation, uplifting and beautiful. Well, they don’t currently have that record contract so this is their way of releasing music. Also, all a record company does in reality is lend money to bands at a rate way worse than they’d get from a bank, while taking the ownership of the music away from the band. Getting an advance from the band’s fans makes the most business sense of all. If they don’t reach their target, ie the whole cost of the project, then no-one’s money is taken. That’s the way crowdfunding works. If they do reach their target, all is good because they have already sold the items to be produced. The customer feels involved in the process so it’s a great way to build and maintain fan loyalty. I think you should do a little bit more research into the concept of crowdfunding and the positive impact it has on musicians and artists before making ignorant and ridiculous comments like the one you made here. I would much rather pay amazing artists like Niyaz directly for the music they make than to give it to a major company that in turn only gives a small portion to the artist. Also, your conflation of this topic with prostitution is quite crass and inappropriate. Artists like this don’t make millions off record sales like some mainstream top 40 musicians make, they make their livelihoods (modest in most cases) off the support of their fans and crowdsourcing is an excellent and efficient way for for artists to raise the cost of producing an album. No, it’s a self release. I have been a fan of Niyaz and Azam Ali for over 10 years. I recently received a download of this new album “The Fourth Light” 2 weeks ahead of its planned international release as a bonus for purchasing the album through their crowd sourcing campaign on pledge music. All of their albums are fantastic and well worth the money to purchase the entire collection, but this latest one is particularly good. I have been listening to it basically on repeat since I got it. Its amazing. I couldn’t recommend it more. I also buy a lot of very obscure music for our podcast! I love hunting for new music. We were referred to this page by a fan. Thank you Vince for the kind words about the album and support of our music. As for Mr.Beni Fuchs, once we were able to get past the utter disgust and disbelief that a man holding a musical instrument could use such language on a public forum to express his obvious lack of knowledge about what it is to be a professional artist these days, we have decided that maybe you are not alone in your ignorance. Therefore we thank you for motivating us to write an official blog explaining in detail what it is like for artists these days in a world where even musicians believe you are a whore if you expect to be paid for what you do. We will be sure to use your eloquent quote relating crowdsouring to prostitution, and credit you for it by adding the link to your facebook page. But just to clarify one important point, there is a BIG difference between releasing an album on a label as a “signed” artist and just “licensing” an album to a label, which is what we did for The Fourth Light. We will be happy to enlighten you on this topic in the coming days.